The Southern Illinois University Edwardsville Police Department and School of Pharmacy (SOP) collected 24.2 lbs. of prescription drugs in a drug takeback program Saturday, Aug. 12 during Edwardsville’s Goshen Market. It was the largest amount collected this year in the program. The SIUE Police Department has a pharmaceutical disposal receptacle from Illinois American Water and the Drug Free Coalition of Madison County available to the public 24/7, 365 days per week. The drop box is located in the SIUE Police Department lobby, located at 99 Supporting Services Rd. 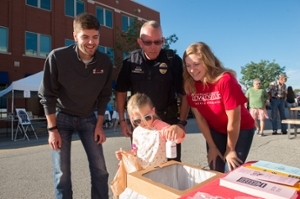 Photo (L-R): SIUE Police Sergeant Daniel Murphy is assisted by School of Pharmacy students Conner McClain (left) and Jami Cain (right) at the drug takeback program during Edwardsville’s Goshen Market.